Although teaching ultimately was a fun and fulfilling career, there were niggly little things about it that I felt could have gone better. One of these was the fact that there were frustratingly few students who went into teaching as a career from among the thousands that I taught; and from the top sections, you probably need just the fingers of one hand. It was not, however, as though I did not know why. It was not a phenomenon that was unique to the school where I used to work. Teaching was – and still is, in this country – not a financially rewarding career; and so was seldom top of the list of bright-eyed fresh high school graduates seeking their paths into the world of adults. 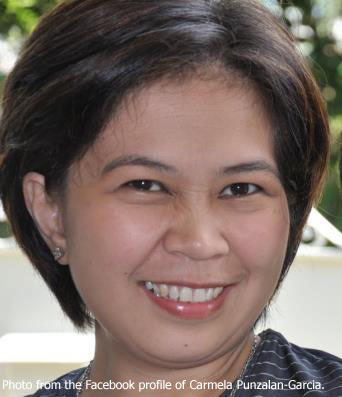 Carmela Punzalan-Garcia of the high school class of 1993 – the Pearl Batch – was one of the few for whom becoming a teacher was a conscious and deliberate choice rather than something forced upon her by circumstance, as happens to many who land in the profession. She was from the top section as well, which made her becoming a teacher all the more edifying. 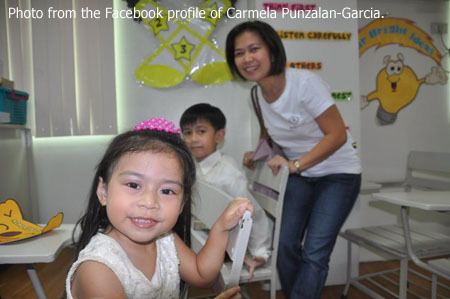 Carmela is the youngest child of Claro Punzalan – now deceased – and the former Erlinda Marajas of Sto. Tomas, Batangas. Two of her three siblings – Carlo and Carol – were also my students. If ever God showed favouritism when dispensing intelligence to the world, then it was in granting more to all three Punzalan children who were my students. After high school, Carmela enrolled at the Philippine Normal University in pursuit of a bachelor’s degree in Elementary Education. She commuted every day during her four years in college from her hometown to Manila, a small price to pay in pursuit of her dream. By 1997, she acquired her degree and took great satisfaction and a sense of accomplishment in a dream fulfilled. Initially, what she wanted to do was to join the teaching force at the North Central public elementary school in Sto. Tomas. This school fed La Salle with so many excellent students through the years; and Carmela was also its graduate. However – during her final exams in March of 1997 – a neighbour in Sto. 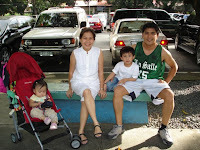 Tomas invited her to apply for a teaching post at La Salle Green Hills. “She was a Science teacher of LSGH and would always tell me that I would definitely enjoy teaching there,” Carmela says of Cel Dicen, the neighbour. Although she was somewhat intimidated by the thought of the long daily commute from Sto. Tomas to San Juan, she also saw the challenge of another mountain to climb. She took her neighbour up on her invitation. Time can, indeed, fly; but seemingly more so in a school where no day is ever quite the same as the other. Carmela is now onto her sixteenth year at LSGH. She teaches Grade One pupils and is with the school’s Sibika-Hekasi Department. She is also presently Team Leader of Sibika at Kultura; a member of the Lasallian Justice and Peace Committee; and the Level Facilitator who guides new teachers in their observance or religious activities, punctuality in attending school activities, adherence to best practices and observance of manual provisions. The fact that Carmela works for a school where the compensation packages are reasonably better than most has not made her forget the plight of fellow teachers around the country who are not as similarly blessed. After a pause, she adds, “There are times when I’m in the mall with my family, someone suddenly approaches and recognizes me as his teacher in the past. That is very rewarding.” That may sound terribly mundane to some; but only a teacher can know the deep sense of fulfilment and satisfaction that comes when something like that happens. 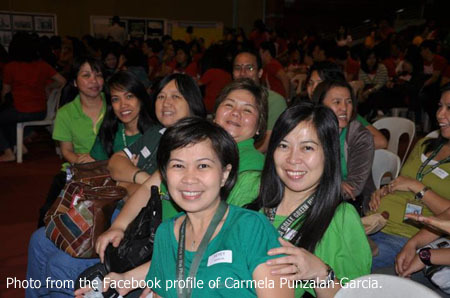 Teaching at LSGH also means that Carmela gets to teach the children of some celebrated personalities. Christian Recto, son of Senator Ralph Recto and Vilma Santos, used to be her student. So was AJ Perez, the ABS-CBN Star Magic talent who was tragically killed in a road accident last year. Travel is also among the perks she has enjoyed working at LSGH. Carmela has visited Thailand and various cities around the Philippines like Ilocos, Pangasinan, Samar, Leyte, Panay Island, Cebu and Bohol, among others. “I am so thankful to La Salle Green Hills for giving me these travel opportunities,” she says. Outside of work, Carmela enjoys bonding with the rest of her family and taking pictures of her children. She is married to Francis Rafael Garcia, the son of an employee of LSGH. The couple currently lives in Pasig City and has three children. Claro Antonio, the eldest, is eight. He is followed by four-year old Amparo Margarita and Julio Rafael, just three years of age. Many of Carmela’s contemporaries will probably be wealthier and have seen more of the world. Few, however, will come close to her in terms of the power to change the world. When Carmela stands in front of her Grade One class, she holds in her palms the future. It is a privilege that few ever get to claim.